HomeHEALTHWaging a lox-tox war on fleas! I’ve waged a full blown war in my house. The enemy: agile, black and miniscule. Master of camouflage and resilient. 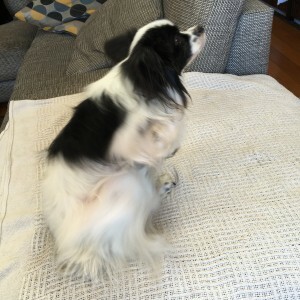 Yep, it’s those pesky fleas making my dogs’ lives miserable, causing incessant itching and irritation with their blood sucking antics. This unseasonably warm weather has created a mini boon in flea numbers at our place and it’s possibly one of the worst breakouts I’ve experienced in many years. So why not just reach for one of those commercially available flea protection and prevention treatments and ‘flea-bomb’ the house you say? Well, many years ago I didn’t hesitate to use both of these in my armaments, usually to great effect. But there’s a reason these products are so potently effective on these little bugs; they are loaded with some very toxic chemicals. Most of the topical products used on our dogs are absorbed through the skin and contain neurotoxic or carcinogenic substances, which are apparently at levels acceptable for use on our dogs. But when a product suggests I take extreme caution not to get it on my own skin, and to wash hands thoroughly after use, I’m quite frankly perplexed why I should then go and put it on my dog’s skin all year round! I’m also not keen on feeding my dog a product that repels fleas without seeing some long term studies on potential effects. My philosophy is, if it chemically damages the parasite, it has the potential to affect the host in some way. Many animals are also highly sensitive to the chemicals in pesticides and repellents; small dogs and cats are particularly at risk. So my preference is to use treatments that place far less toxic burden on my dogs, even though they typically require much more patience, effort and experimentation. To manage the problem the low-tox way does require some extra effort, but I think the benefits are worth it. The low-tox options below seem like a lot of work I know, but I’ve found it becomes routine around flea season, and I adapt the extent I go to depending on the severity of the problem. Understanding the flea lifecycle is the key to understanding the problem. The adult fleas you can see are probably only about 5% of the population living in our around your house. Fleas are prolific breeders; a pair can produce about 7,000 fleas a month! The eggs hatch after two to 12 days into larvae about three or four millimetres long. They shed there outer layer twice and as they mature, spin a cocoon which they might stay in for anything between a week and one year. They will generally emerge when there is warmth and the promise of a good tasty host like your pooch. Because of this potentially long and variable life cycle, you need to tackle the problem from a number of fronts; eradicating them from your dog, your indoor environment and outside. Banish fleas from your yard…. So I suggest starting with treatments from the outside in. There are are few little all natural tricks to help you out here, starting with nematodes. These are natural flea predators, also known as ‘eel worms’ that are colourless, microscopic worm-like animals. Selecting the right type of nematode won’t harm the beneficial insects in your garden, the plants or animals. How amazing is that! In Australia you can go on-line to buy nematodes specifically for fleas and you’d use them in Spring and Autumn to prevent fleas from taking over. You can also plant up a few herbs that fleas find repulsive. Rosemary hedges or pots are great, as is sage, lemon balm, lavender and catnip (obviously a bonus if you have cats!). This is where the elbow grease comes in. Your vacuum is going to get a good workout here – daily on areas that your dog frequents. 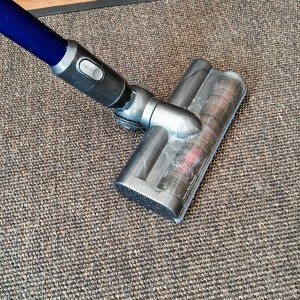 Steam cleaning rugs and carpets for more serious problems is also essential. Regular washing (at least once a week) of dog bedding with a touch of Eucalyptus oil is also helpful. After vacuuming and washing bedding, I give a good spray of my own homemade flea repellent (recipes to follow on my next blog!). Another natural trick is to place a shallow saucer filled with water and some liquid soap. Place it on the floor under a night light. The light apparently attracts the fleas and they leap to their watery death trap! I haven’t tried this yet but may just give it go and report in a future blog. Diet: There are a number of things I try on my dog to rid them of these parasitic pests. First and foremost, I have them on a healthy species appropriate diet that promotes vitality and good gut health so their immune systems can stand up to the often allergy-inducing flea saliva. Parasites are attracted to animals with a weakened or compromised immune system. Parasites are attracted to animals with a weakened or compromised immune system. I also give more frequent doses of fresh garlic to my dogs. It’s a controversial ingredient, as garlic contains thiosulphate. In large doses it can cause hemolytic anaemia and damage to the liver. However garlic only contains smaller traces of thiosulphate and most dogs would have to have a lot for it to have such effects. Giving small doses reduces this risk and is noted in herbal medicine as for its antiparasitic, antiviral and antibacterial properties. 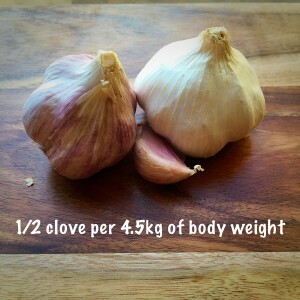 For my small papillons under 5kg, I give them 1/8 – 1/4 of a clove every other day. When the flea problems is reduced, I cut back on the garlic to only once a week or fortnight. I also like to give the immune system some support to stave off flea allergies and hot spots. I add a little bovine colostrum or some immune modulating herbs like ginseng a little more frequently to their meals in the lead up and during flea season. Grooming: To rid the fleas, I start with a good bathing to drown any on the fur. I use a neem based soap or shampoo (neem is an ancient medicinal remedy from the neem tree and pests generally don’t like it), followed by a long soak in a bath filled with a brew of calendula and chamomile tea. These are both soothing herbs for the skin and help take out the sting from those irritating bites. I then give a final rinse with some diluted apple cider vinegar, which is also a skin soother and makes your dog’s skin a little too acidic for their tastes. While still wet, I then groom the entire coat with a flea comb. I keep a small container of soapy water with a few drops of cedar oil, which fleas generally find unpleasant. My little guys have long fur and I have found that using a hairdryer on a cool setting and parting the fur is a great way of catching any stray flea soldiers that escaped the wrath of the soapy water and flea comb combination. Poor Rupert had the worst reaction to the bites, and his skin was more irritated than usual. As part of his de-flea bathing ritual, I gave him a green clay body mask to sooth the itch and irritation. It worked wonders on his skin, even though you can probably tell he wasn’t exactly impressed with the application! Once the coat is dry, I alternate with a couple of different treatments; one is to apply my home made low tox flea spray (recipes to follow in next blog), the other is applying food-grade diatomaceous earth (DE) mixed with some neem powder to the dry coat. 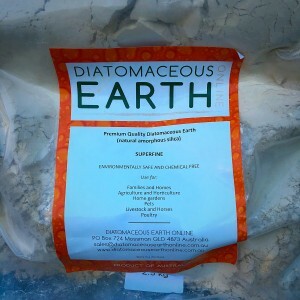 DE is a fine powdery substance made up of the microscopic remains of fossilized ‘diatoms’, which are a type of algae. The cell walls of the diatoms are made of silica, the very same element that glass is made from – and that’s the clue to how it works on the fleas…..the sharp edges of the diatoms cut through the flea’s exoskeleton and then effectively dry it up. It’s best to apply the DE on your dog outside with plenty of ventilation. Take care not to breath in the particles as they can irritate lungs. DE comes in different grades and quality (make sure you have food grade DE, not the stuff they use in pools!). It can leave the coat feeling a bit dry for a while, but that’s a small price to pay for low-tox flea management in my books! I usually leave it on for a few days before rising off. You can also sprinkle on the dog’s bedding or carpet and rugs before vacuuming off. 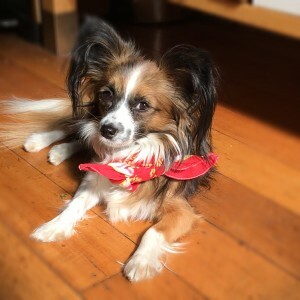 When I use the DE, I still apply some of my low tox flea spray with essential oils, but instead of adding it to the coat and wetting the DE, I put apply it to some snazzy little bandanas and place it around their necks. Flea fighting fashion! What if lox tox just doesn’t work? If the infestation is just too severe or your dog is really suffering, then a pesticide repellent may be your best option. You also have to weigh up the risks of other pests that you are trying to keep away from your dog, like the dreaded tick. If you are in high risk areas of ticks, then you may have little alternative than to use a good commercial chemical repellent. 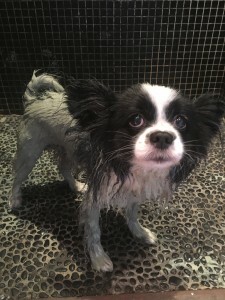 In these instances, I recommend that you look for alternative ways to reduce the toxic chemical burden elsewhere for your dog, whether in their shampoos, toys, bedding and the importantly, the synthetically-made chemicals around your home. So who is winning the war at my place? Well, after three weeks of semi-vigilant application of the treatments above (sadly I am human too and despite my best intentions, life can get in the way!) I’m pretty sure I am winning the war. Those itsy-bitsy terrors have won a couple of battles for sure, but I’ve decimated their numbers with my lox tox arsenal and proud of the fact I’ve spared my dogs a few toxic chemicals along the way.